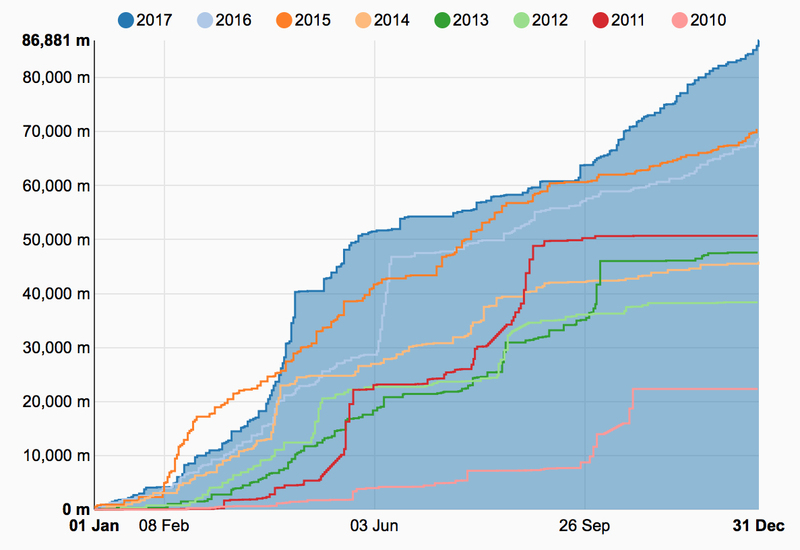 2017 was the third year in a row that I managed to bike more than 10000 kilometres, and mostly thanks to the combination of great weather and plenty of free time in October, I even made this my best cycling-year ever with 11330 km (but only with a tiny margin over 2015). 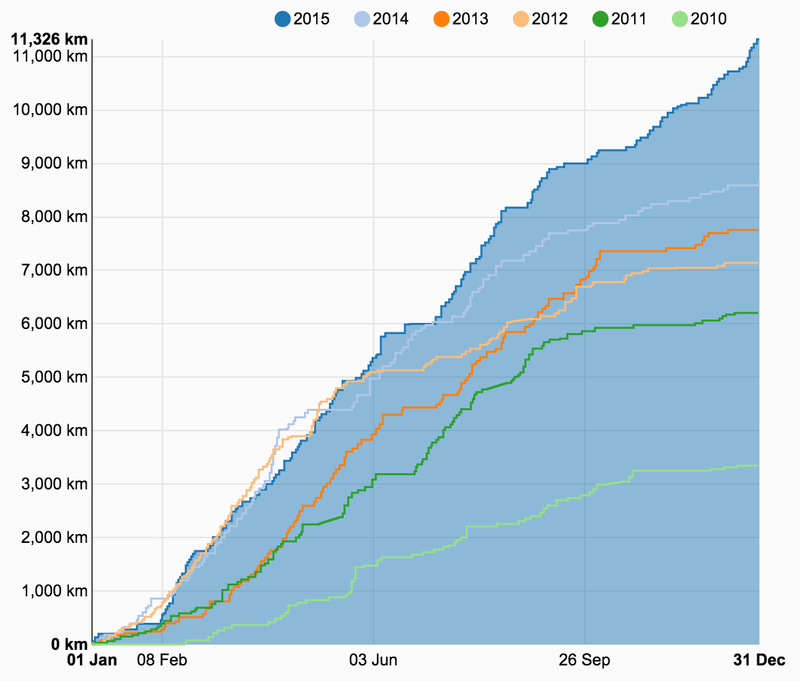 October became my best month ever by a landslide, totalling in 1813 km, 65h 48m, and 9218 m of elevation gain. I had no special plans for this year, but I still managed to collect plenty of long-lasting memories on the road. First of all, for the first time since 2013 (and likely for the last time), I took my racing bike to La Palma again to ride during and after my observing run, and since I gained some free time by having a drivers licence, I could put in some extra hours of quality high-altitude training while working at the observatory too. 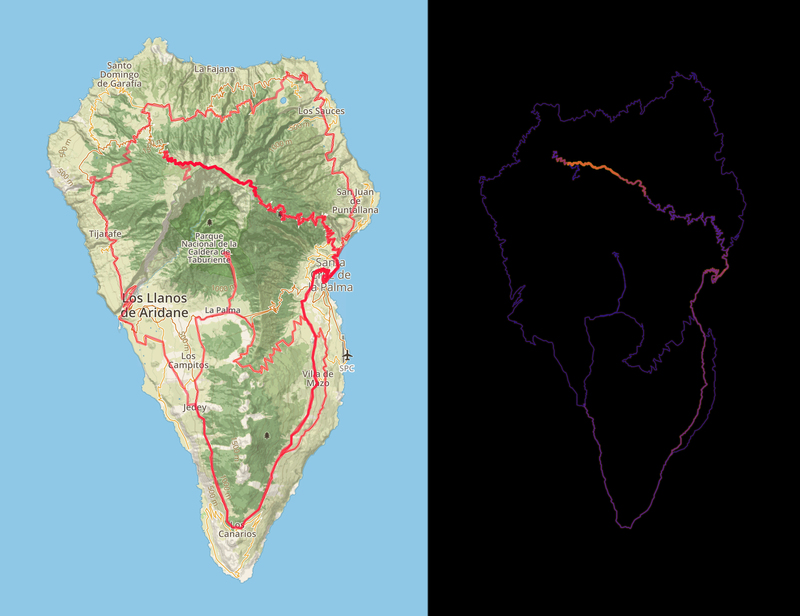 I had a slight insomnia problem afterwards, but still managed to pull off two epic rides around the island (and a few shorter ones). I also did a few beautiful (solo) rides in the Ardennes, which I hope to do more in 2018, because one of my favourite things in cycling is still discovering new, scenic, and quite roads. For the first time ever I finally had a positive experience in a race while participating in the 12 hours of Zolder with Squadra Tornado: I felt strong in my shifts, I contributed to the race, and I came away fully satisfied at the end. And now it is time to look at some maps and figures. 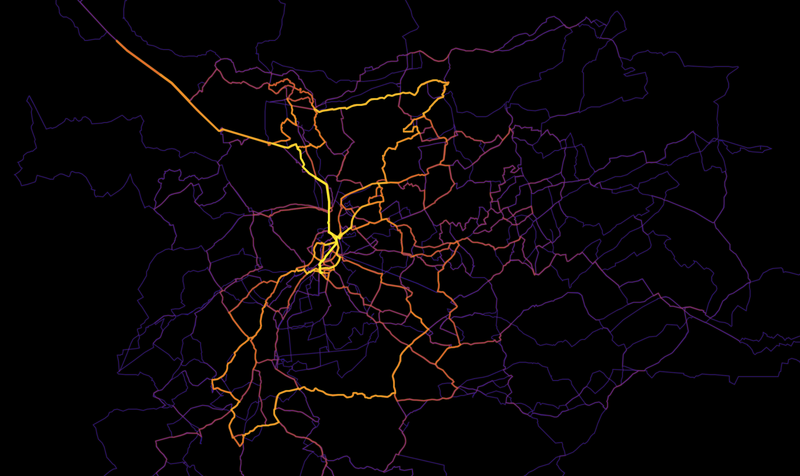 Let’s start with the maps of cycling I have done this year. 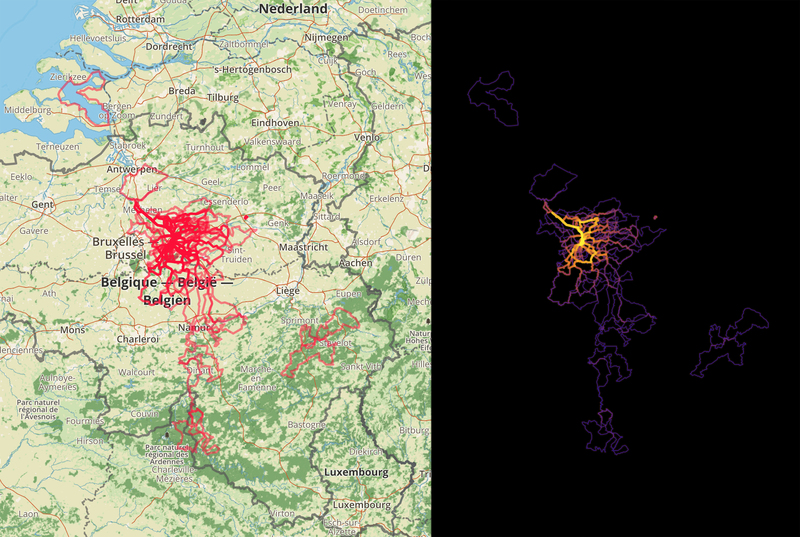 The first two maps show rides mostly in Belgium (with a zoom-in to the heat-map around Leuven), while the third is for La Palma. 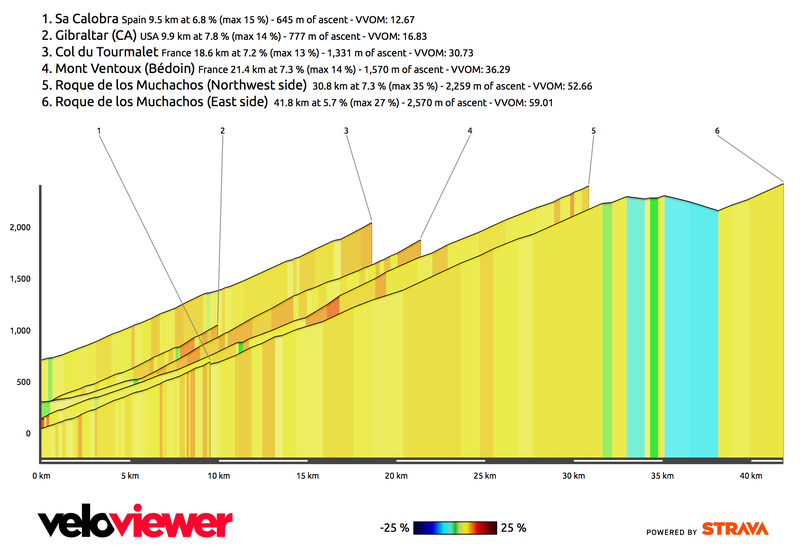 Just for the fun, here is a comparison of some of the bigger / more famous climbs I have done the past few years, with the last two being here on La Palma (although this year I only did the very last in this list). 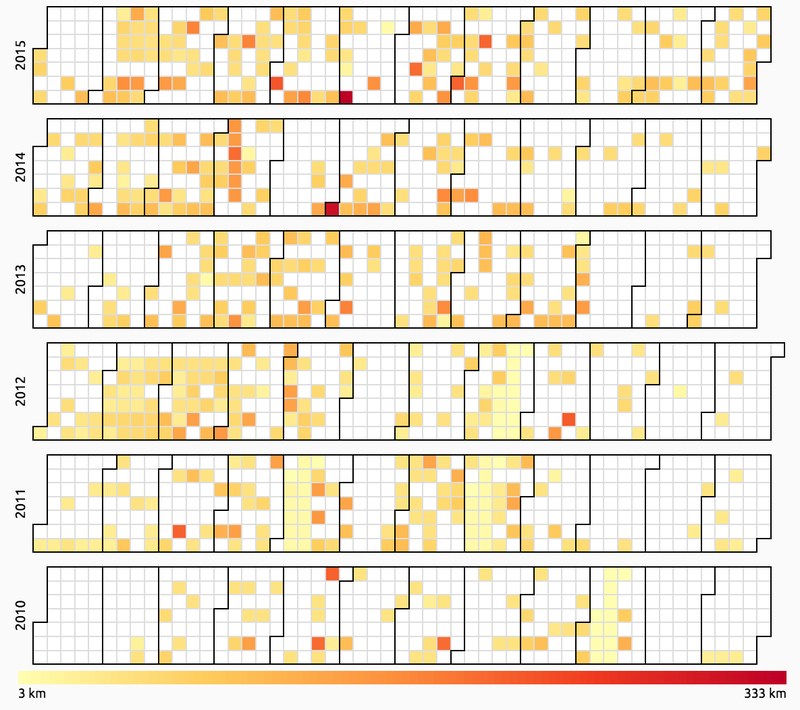 Out of the 155 activities, 110 were done solo, and 45 with at least another training partner, which means that I biked much more often alone this year. My most common partners in crime were Willem (23 times, for a total of 2.2 days) and his brother, Steven (19 times, 1.9 days). Here is a summary table of the rides by bike (note: the average speed for the track bike is incorrect). 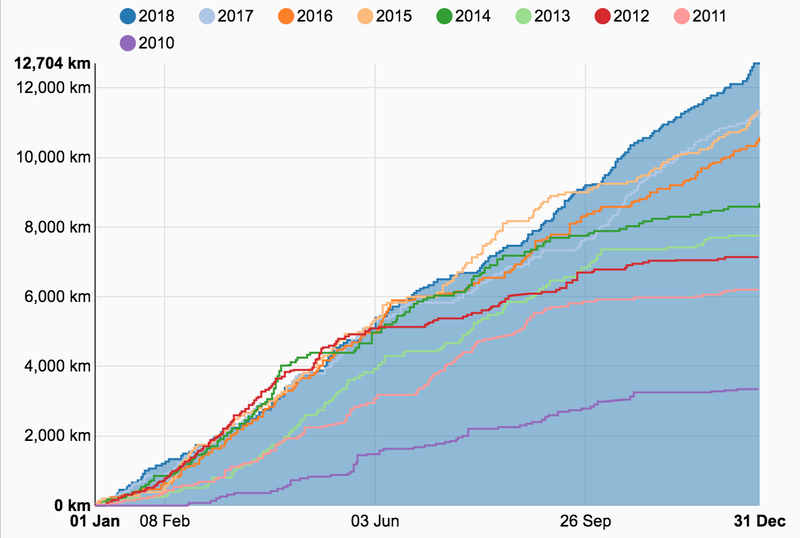 I also did a little bit of running (17.7 km) and hiking (74.8 km), adding up to a total activity time of 431 hours, which is not much worse than in 2015 (~450 hours, because I did much more running back then, besides almost the same amount of cycling). That is ~255000 extra calories burned! 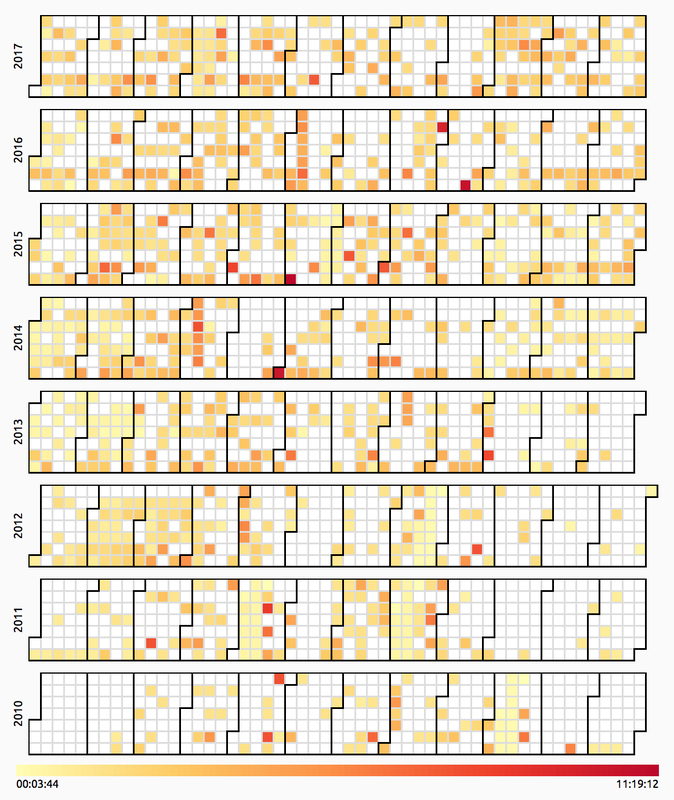 Finally, here is an overview of the evolution of the total activity time, and its distribution across the calendar throughout the years. 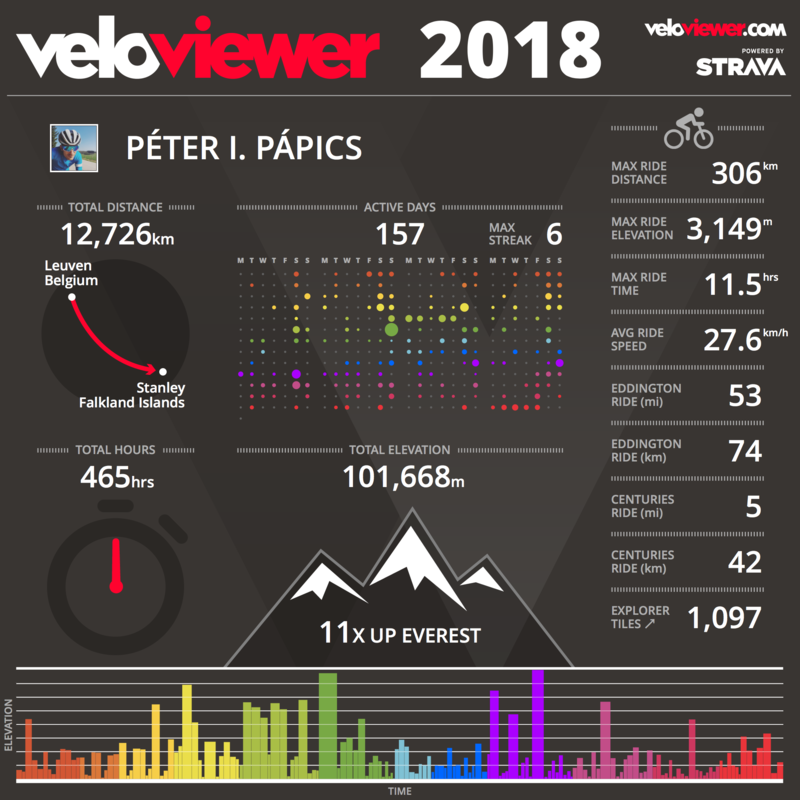 This entry was posted in Uncategorized and tagged 2017, cycling, review, sport, statistics on January 2, 2018 by Péter I. Pápics. 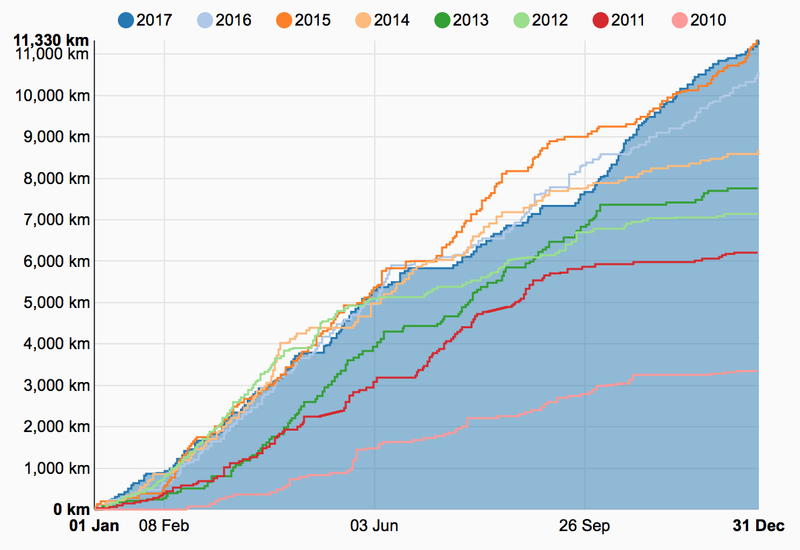 2016 was the first year when my total mileage did not turn out to be a new personal best, but it was still the second year in a row when I managed to cross the imaginary 10000 km line (quite easily), and – most importantly – I had a lot of fun on the bike. The high point of the year was undoubtedly the Trans Pyrenees ride with Willem (which almost single handedly made June 2016 my highest elevation gain month ever), there is really nothing that could come close to that. Honourable mention is given to the 263 km solo ride to the coast which is my longest solo ride to date. I also got a cyclocross bike. And now it is time to look at some maps and figures. 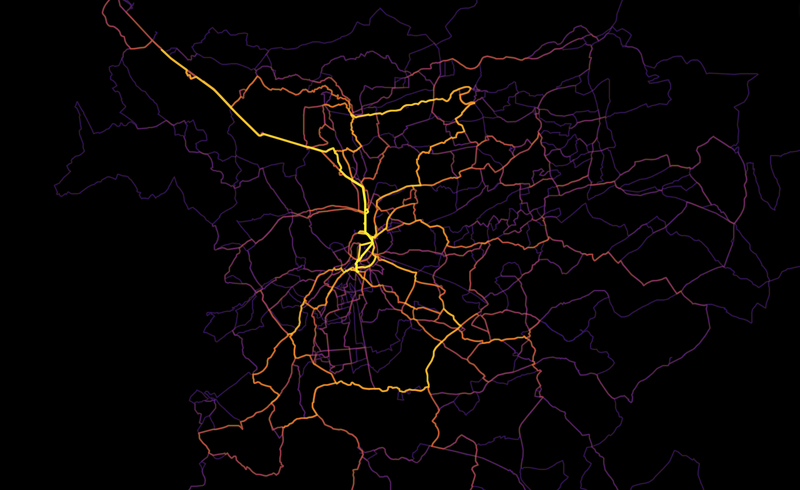 Let’s start with the maps of cycling I have done this year. Out of the 133 activities, 72 rides were done solo, while a large percentage of the rest were predominantly Squadra Tornado group rides. 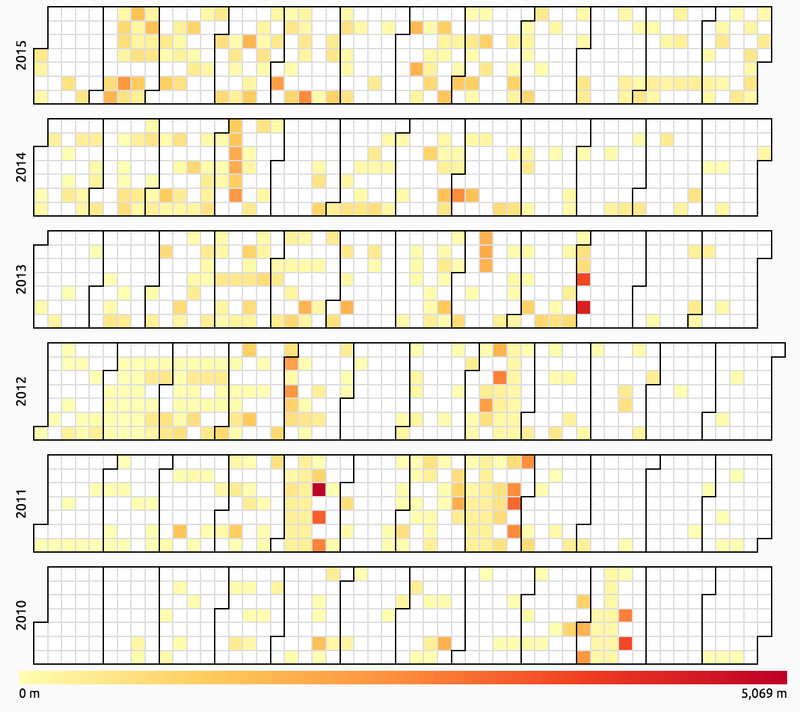 In this sense, this was my most social year on the bike so far. My most common partner in crime was unsurprisingly Willem, with whom I rode together 47 times (a total of 146 hours in duration). Here is a summary table of the rides by bike. I also did some running (120 km) and hiking (38 km), adding up to a total activity time of 401 hours, which is halfway between my numbers from the previous two years. I would be happy with the same in 2017 for sure. At last but not least, here is an overview of my yearly progress (in kilometres, including running and hiking too) throughout the previous seasons. 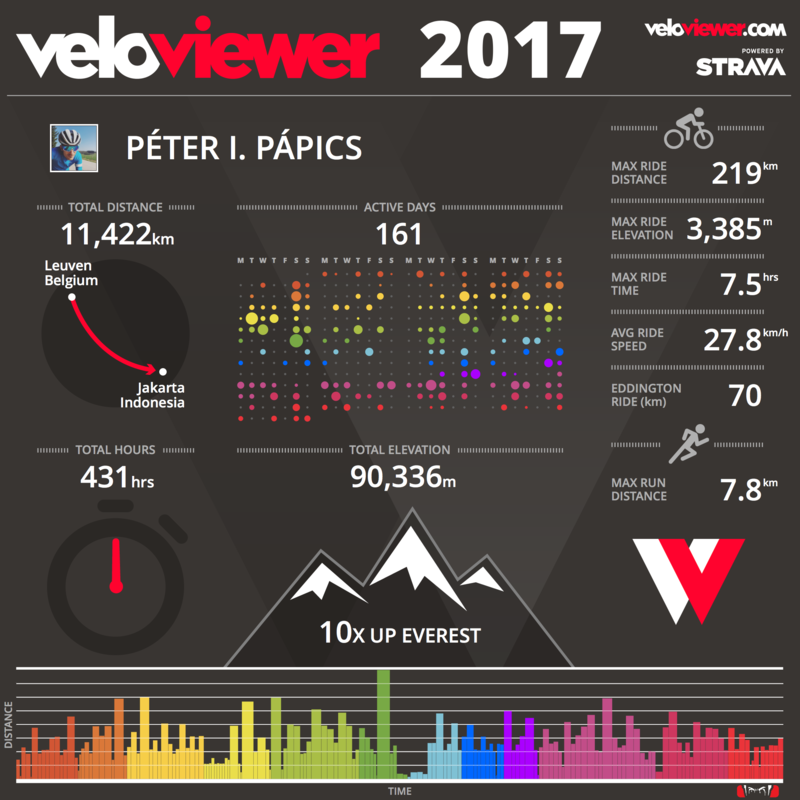 This entry was posted in Uncategorized and tagged 2016, cycling, postdocinleuven, review, running, sport, statistics on January 4, 2017 by Péter I. Pápics. 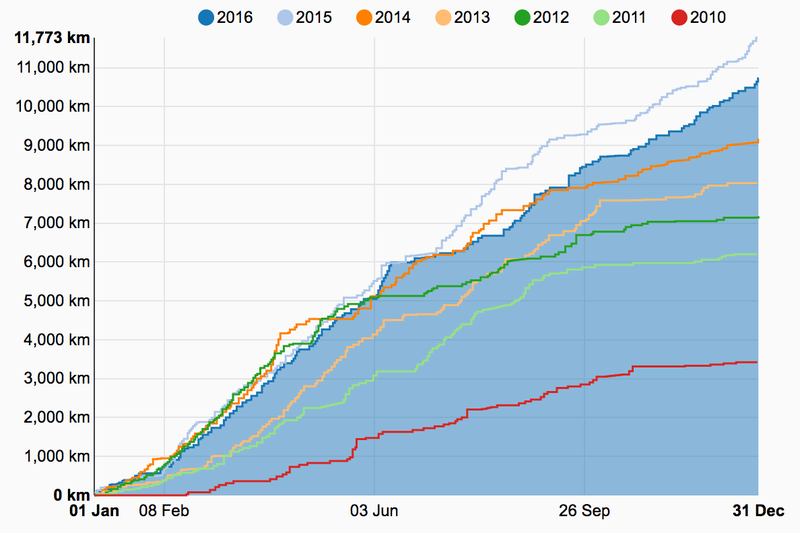 2015 was quite an amazing year on the bike. I have never ridden so much, so far, so long, and with so much elevation gain before. The main themes of the year were definitely epic (solo) rides and new roads. I have ridden also much more alone, because this year I did not join WTCOOL anymore. This is likely to change again next year as I have recently joined Squadra Tornado, a more racing oriented team. The past two months I have already ridden with them on Saturdays. Besides these trainings, I did most of my rides solo in this year’s interbellum, or with Willem, who joined me quite a few times. I spent February working and cycling in Santa Barbara (Southern California, USA), and thanks to the warm and dry weather (similar to an average May/June in Belgium, but without the rain), in just 3 weeks I biked enough to make this month my 2nd best month ever on the bike (and my best month in sports if you add the three 10k runs I did before and after all the cycling). I bought a new road bike, a Canyon Ultimate CF SL 9.0 Di2. Since the beginning of March, I have ridden almost 9500 km with it, and I am extremely happy with the purchase. It’s a beautiful machine. I did many epic rides, some alone, some with a few other guys, and one in a larger group to the coast and back just like last year. 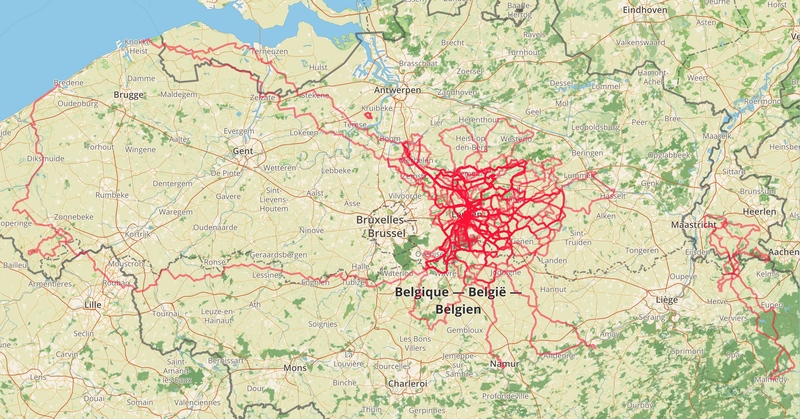 This Heverlee – Knokke – Heverlee ride was my longest ride ever with 333 km thanks to the small extra I did at the end (which made some people question my sanity). Other memorable epic days mostly on new roads include: a solo century around Santa Barbara with summer temperatures, an epic climb, and 5 bottles of water; a 223 km ride to Geraardsbergen in a company of six; 173 km of climbing through the Province of Namur with Willem over 2500 metres of elevation gain, a masterpiece of route-planning; Catching the Tour de France in Namur with Willem, not an extreme long ride, but very nice route, and just a day after coming home from observing on La Palma, so I totally died by the end; a 202 km solo over the Mur of Huy and the Citadel of Namur (a ride of total mental madness); and nicely fitting into the list of epic rides to epic climbs, a 210 km solo to Valkenburg (Cauberg) and back. 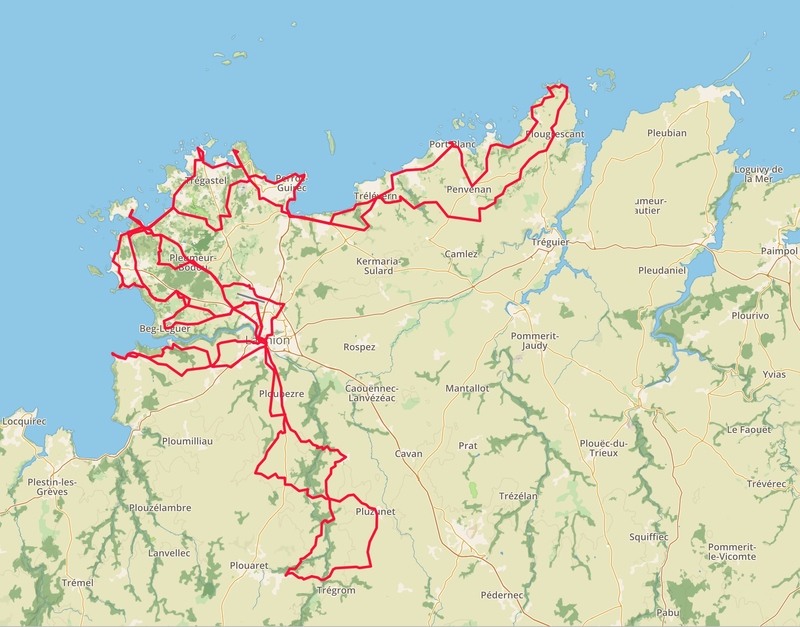 In total I had 5 rides over 200 km, and 11 rides that qualify as at least a century (100+ miles). I have finished one very special challenge on Strava, the Rapha Festive 500, that challenges participants to ride 500 km on the eight days between Christmas Eve and New Year’s Eve. Normally we go to Hungary for Christmas, but this year we stayed in Belgium, so I thought I would give it a try. Although I got soaked twice, and almost blown off the road by the crazy wind a few times, I managed to complete the challenge with 6 rides in 7 days. 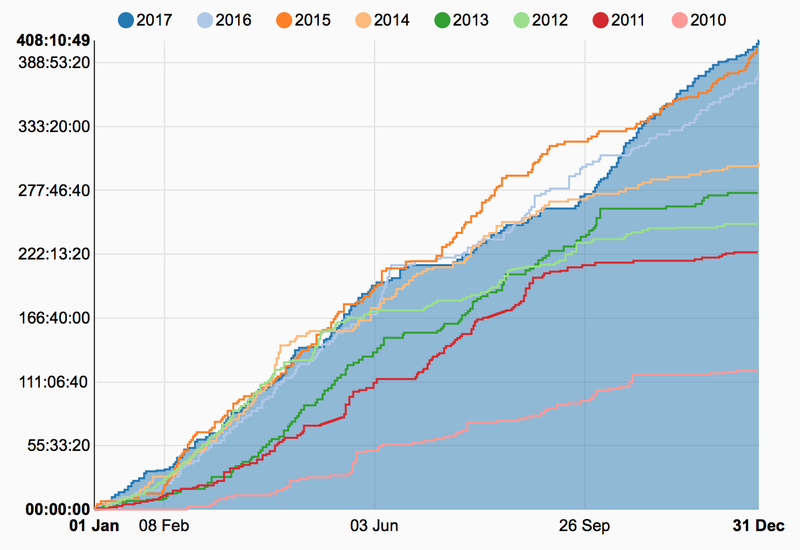 The fact that the average temperature was more typical for April than December helped a lot of course ;) Thanks to the weather conditions and this challenge, I closed off December with 1095 km on the bike. That’s insane for a winter month (in Belgium, not in Southern California), and it is more than I biked in the previous 5 Decembers, combined. 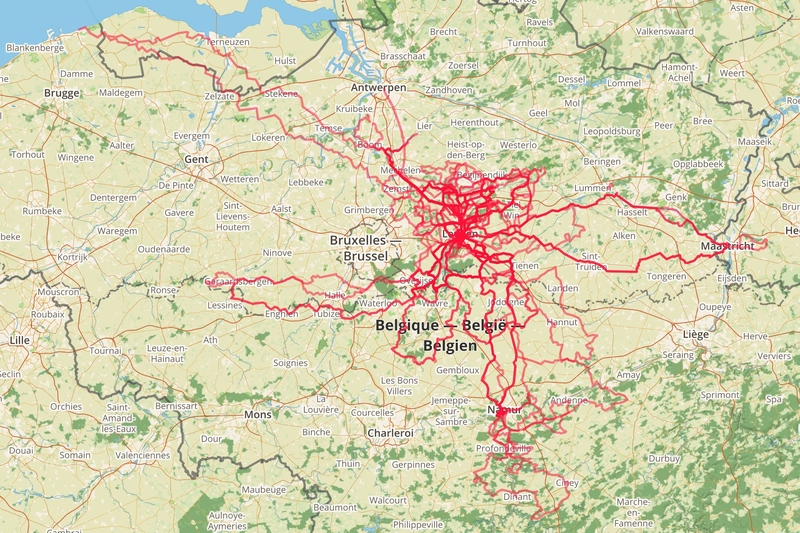 And here are the figures, coming up first the maps of cycling in Belgium, with a zoom in to the area around Leuven to show my most taken loops more clearly, and also a map of the biking I did around Santa Barbara. 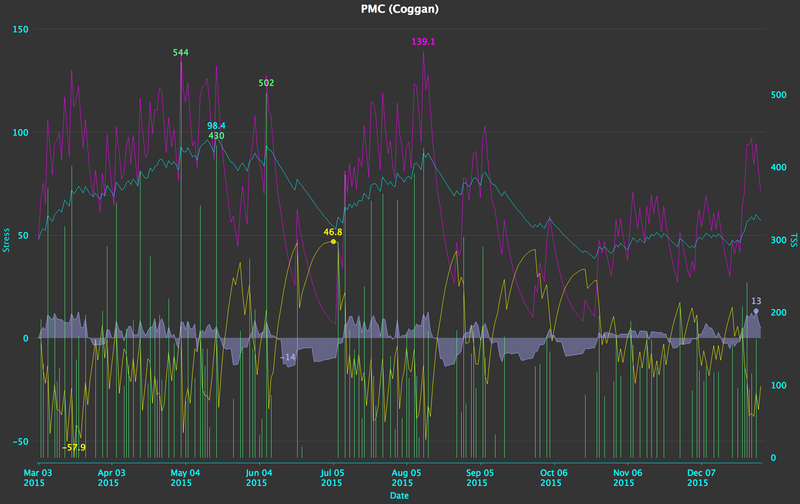 Then here is a figure from Golden Cheetah showing my Performance Management Chart since I have a power meter. 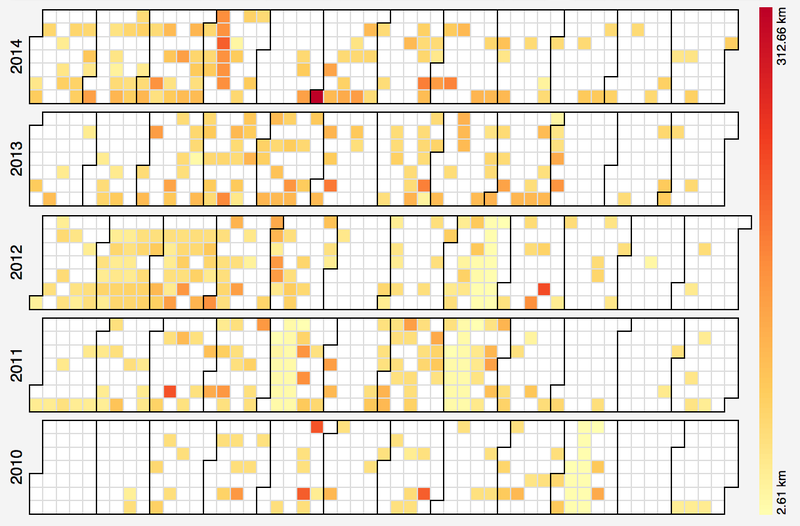 Then here I my statistics grouped by the 4 bikes I have ridden this year. 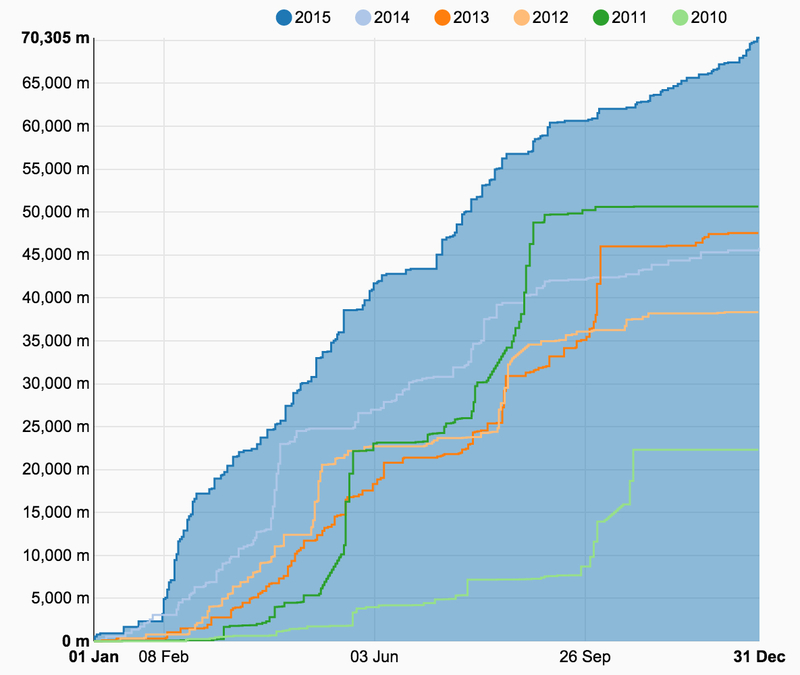 Concerning the social aspects, as I have already mentioned, this year I did many more solo rides compared to 2014. Out of the 140 activities, only 29 were not solo rides, and out of these only 19 were rides where I was riding with more than one person. When I was not alone I rode most often with Willem, on a total of 24 rides (a sum of 79 hours). 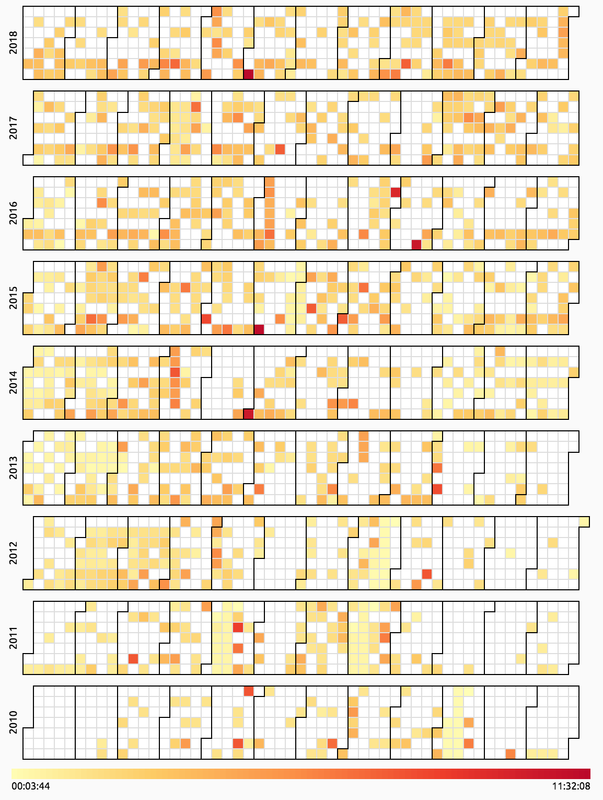 I have also ran 401 km this year (with quite some trail running on La Palma), and did some hiking with Clio, so at the end I had a total activity time of 451 hours (up from 350 hours in 2014). I am fully satisfied with that, and I am happy with all the achievements (see list of Strava challenges completed below) along the way. 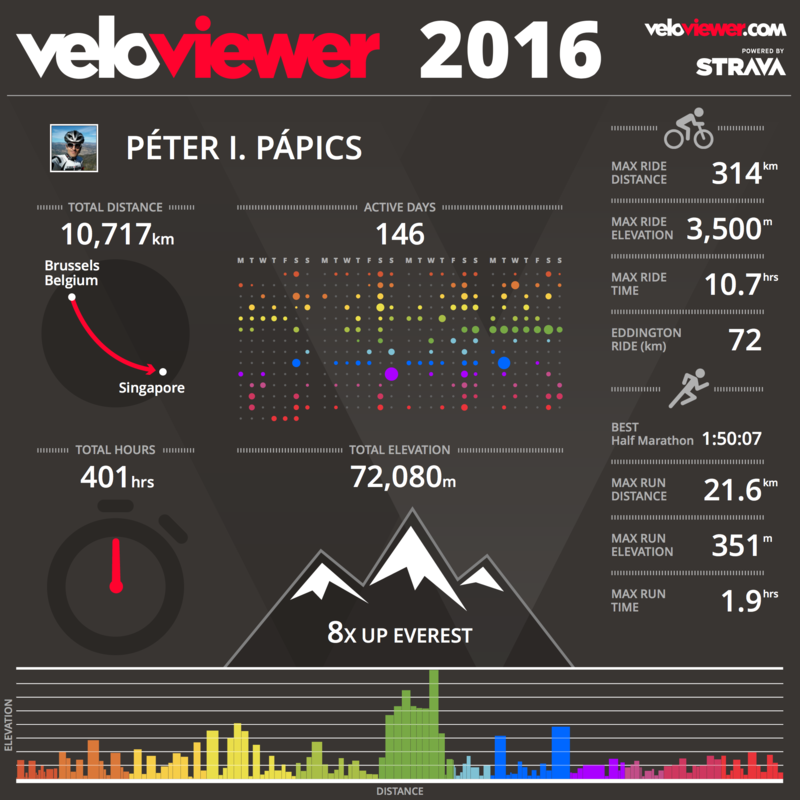 This entry was posted in Uncategorized and tagged 2015, cycling, postdocinleuven, review, running, sport, statistics on January 1, 2016 by Péter I. Pápics. 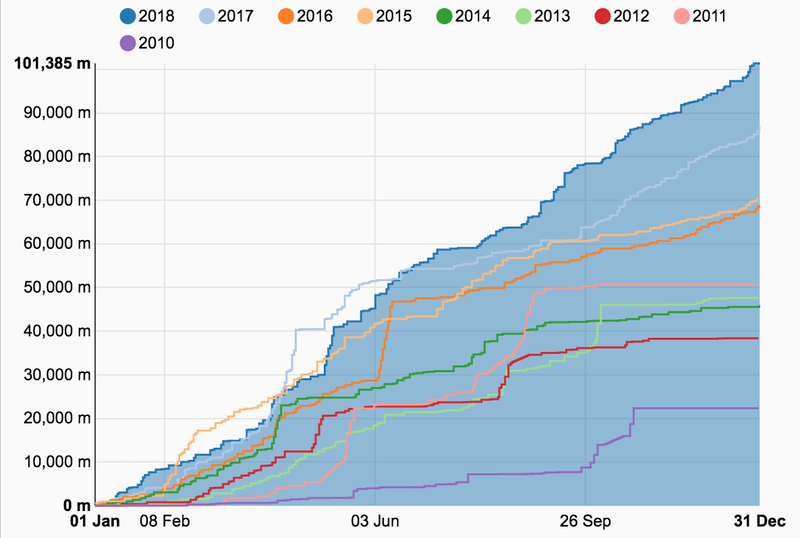 2014 was a great year, not only because of the nice holidays we had (which I still need to blog about…), or the papers I published, but also because I did more sports than any year before (a total of 350 hours of cycling, running, and a tiny bit of hiking). 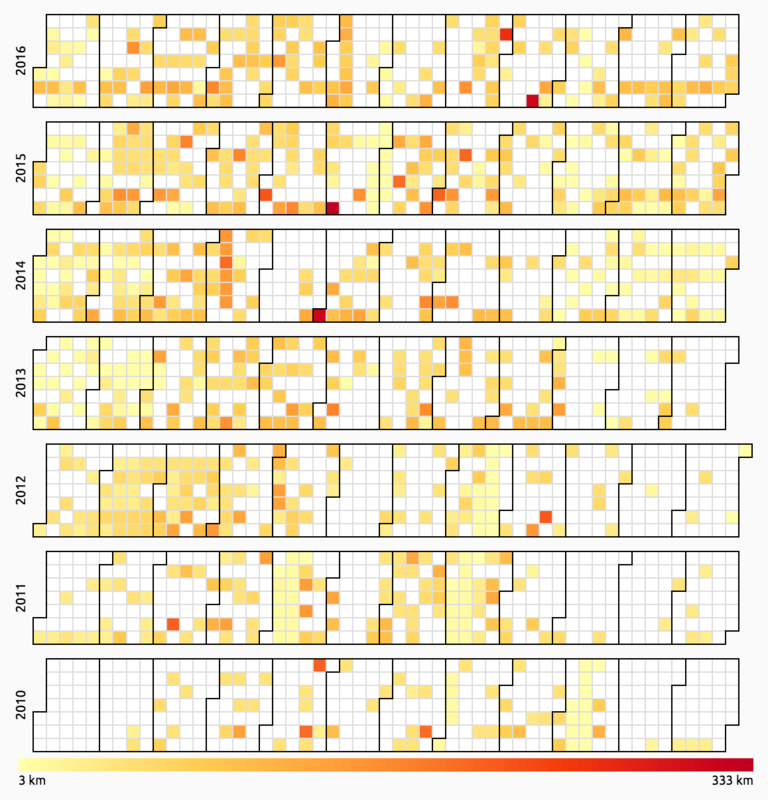 Before jumping into numbers and figures, let me review the main events. 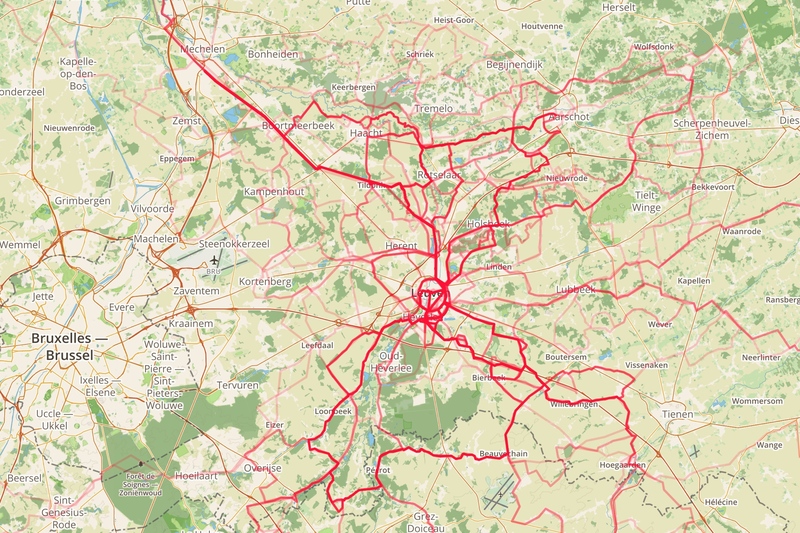 Cycling: First of all, I bought a mountain bike – which was even stolen and found once since then (thanks again to the police and the people who spotted the suspicious activity) -, but so far I have not ridden it as much as I planned to (only 261 km in 7 rides). But it is very nice to ride through the forest with it, so I am happy with the purchase in any case. On the road bike, I had my longest ride ever (both distance and duration wise with 313 km in 10h 34m, see it on Strava for more), riding from home to the Belgian coast and back with several members of WTCOOL. Luckily, the route was totally flat… It was a great day, and we even had energy for a sprint along the channel around the 300 km mark. Crazy times :) I also had my heaviest week on the bike thanks to the holidays (a.k.a. training camp) on Mallorca with 962 kilometres, 9939 meters of elevation gain, and 34h 52m in the saddle, which meant that at the end of the week I was in the top 10 of Belgian Strava users! 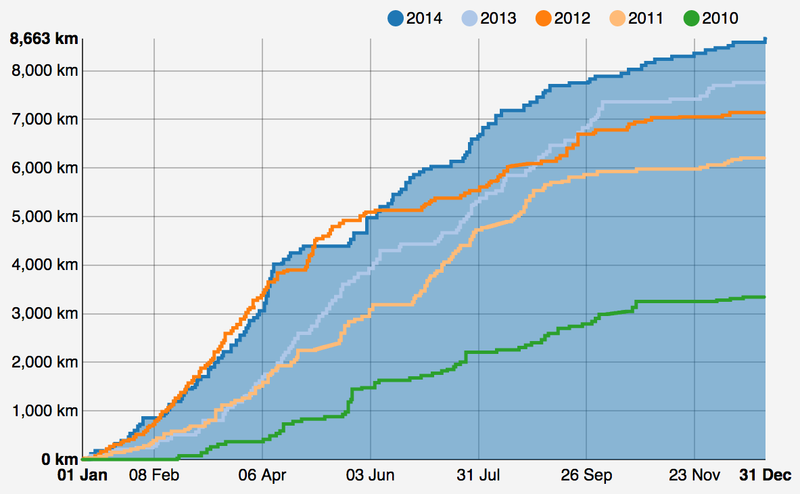 This of course made April my best month ever too (1532 km, 11371 m+, 53h 53m). 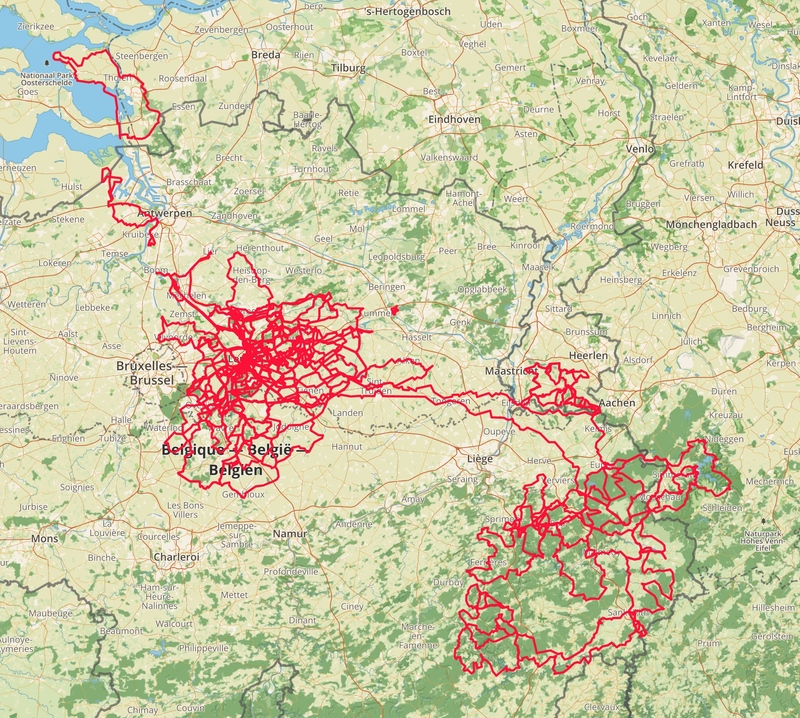 Later through the year I participated in the 24 hours of Zolder (138 kilometres with a nearly 40 km/h average speed) and had a few nice organised rides in the Ardennes too (e.g., see picture above), with great company. All in all, this year saw me transforming from a lonely cyclist to a social cyclist. I still do solo rides, but it happens more and more often that I have someone else to ride with even at random times. I think the biggest change came this autumn, when I started running again, but this time – beyond keeping my fitness level a bit higher during the winter – with some actual goals in mind: namely, running a half marathon, and participating in the annual end of year run in Leuven. Staring from October, I was running 2-3 times a week, first on La Palma at 2300 meters, then most often at work with my colleagues, mostly through the forest, and as my body get more and more used to the running, I started actually enjoying it. Since after one point I was not constantly suffering, I got time to just enjoy being outside, a bit more like how I enjoy cycling. Running is much nicer when your mind is not too busy about dying on the spot. Of course I run for the achievements, the feeling of accomplishment, the instant nirvana which a well executed run delivers. I feel exactly as it is written/drawn in one of the great Oatmeal comics here. (Of course this stands for cycling too.) And with the fun, and a new running GPS (Garmin Forerunner 920XT), the results also came: after raising the distance week by week, I ran my first half marathon on the 27th of November through the forest with two colleagues (it took a little bit longer than two hours, since one of the others were a bit sick, and we wanted to do it together, as we did all the training together). It was a great feeling to accomplish something new. Then soon afterwards I did a solo half marathon after work into the evening with a headlamp, where I improved my time to 01:51:29 (5:17/km), which is a nice PR for the future to improve on. 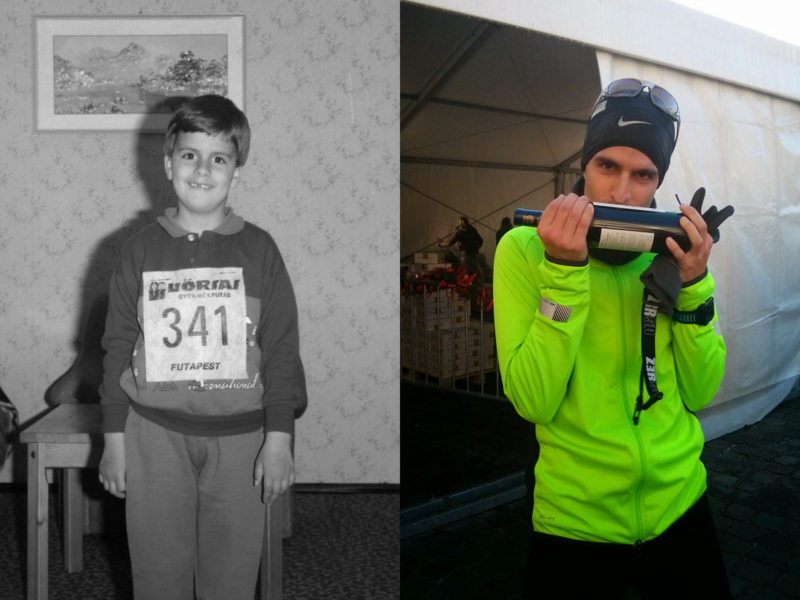 Then after training even during the Christmas holidays in Budapest, I participated in the first running race since that Kids Run back in the previous Millennium: I ran the 12k Eindejaarscorrida of Leuven in -4°C, and finished 597th out of the 1965 participants. Not only is this a top 1/3 finish, but I also broke all my previous best times on 1 miles, 5 kilometers, and 10 kilometers with an average pace of 4:43/km. For me, this was a really amazing result, and I was extremely happy after the finish (but during the run too). I even ran home afterwards. It was indeed a great year of sports. I hope 2015 will not disappoint either! 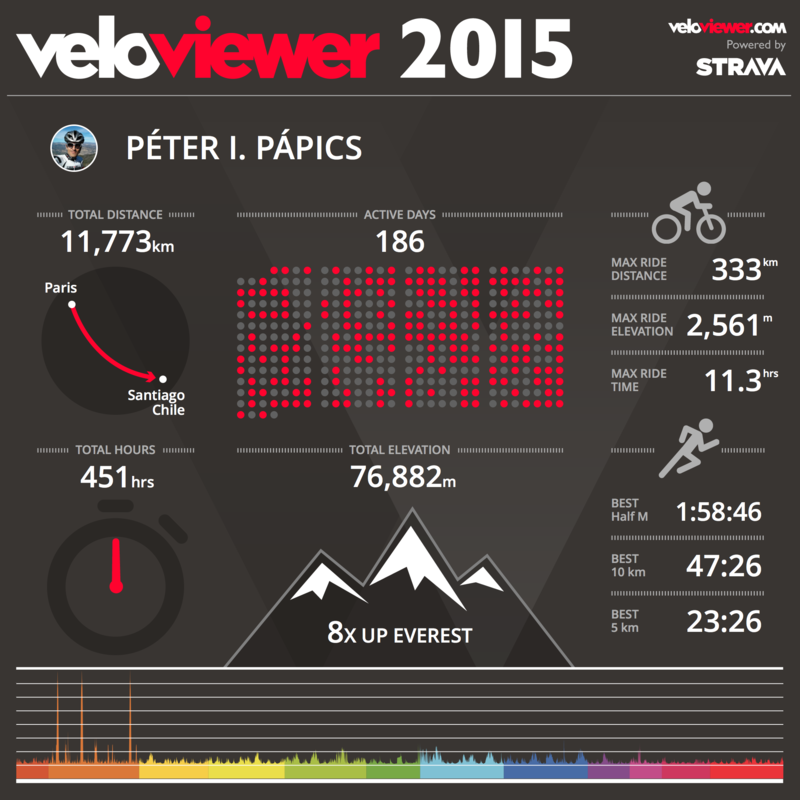 This entry was posted in Uncategorized and tagged 2014, cycling, postdocinleuven, review, running, sport, statistics on January 10, 2015 by Péter I. Pápics.